At the very core, innovation is a gamble, an entrepreneurial bet. 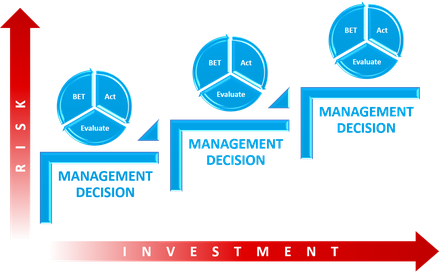 Management bets a huge amount of company resources on innovation success, aiming to win a jackpot filled with attractive products and competitive advantages. Due to the time-consuming nature of innovation, this bet is not short lived but reappears again and again, requiring management to answer the same question again and again: do you raise the stakes or fold your hand? Betting is gambling, and gambling comes with the risk of losing. For most humans, managers included, risk triggers powerful emotions like uncertainty and fear. Last and final, gambling is about taking chances and taking chances equals loss of control.